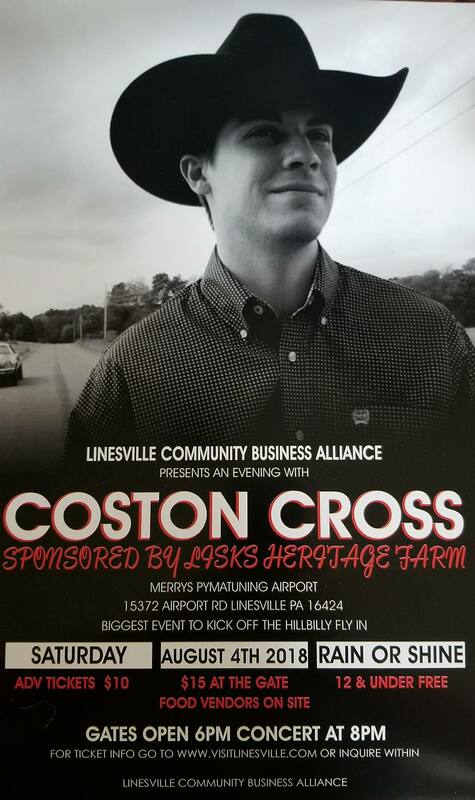 With special assistance from Swartz’s Mid-America Entertainment, presented by the Linesville Community Business Alliance (LCBA), and generously sponsored by Lisk’s Heritage Farm; proudly announces a Country music concert to kick off the week-long Hillbilly Flyin’! Tickets available starting June 29th at these select Linesville Businesses: Lisk’s Heritage Farm, Twin Pies, Eagle Nest Pizza, Bespoke Boutique, Shady Acres Campground, Voy Rivers BBQ, Mama T’s Hometown Pizzeria, Finders Keepers Thrift, Merry’s Hardware, and Forestview Restaurant. Advance Tickets are $10 each. $15 at the gate. Children 12 and under free admission. Gates open at 6pm, Concert starts at 8pm. Rain or shine. The Linesville Rotary and Mama T’s Hometown Pizzeria will have their food truck available. Visit our event sponsor’s Facebook page to learn all about them. Visit Coston Cross’ Facebook to learn all about the Musician. Coston Cross will be performing his hit songs to kick off the Hillbilly Flyin’ week! Coston Cross walked on stage for the first time close to two decades ago, and he never looked back. It was just the beginning, and no one knew where it would lead. From school talent shows, to singing in competitions, then finally traveling with his band, he has taken the slow and steady approach. During the early years the influences of artists like Garth Brooks, George Strait, and Chris LeDoux played an important role. “I spent many hours as a kid in the back of a dually listening to those guys. That smoothness Strait had and those cowboy songs of LeDoux really drew me in as a kid, but then there was Garth. That level of energy really spoke to the five year old me.” Cross said with a laugh. Now all these years later you can see those influences every night his boots hit the stage. With songs like “Out the Door” and “Let Me”, he delivers a song for everyone. “You know, I write my songs thinking about how they will go over live. 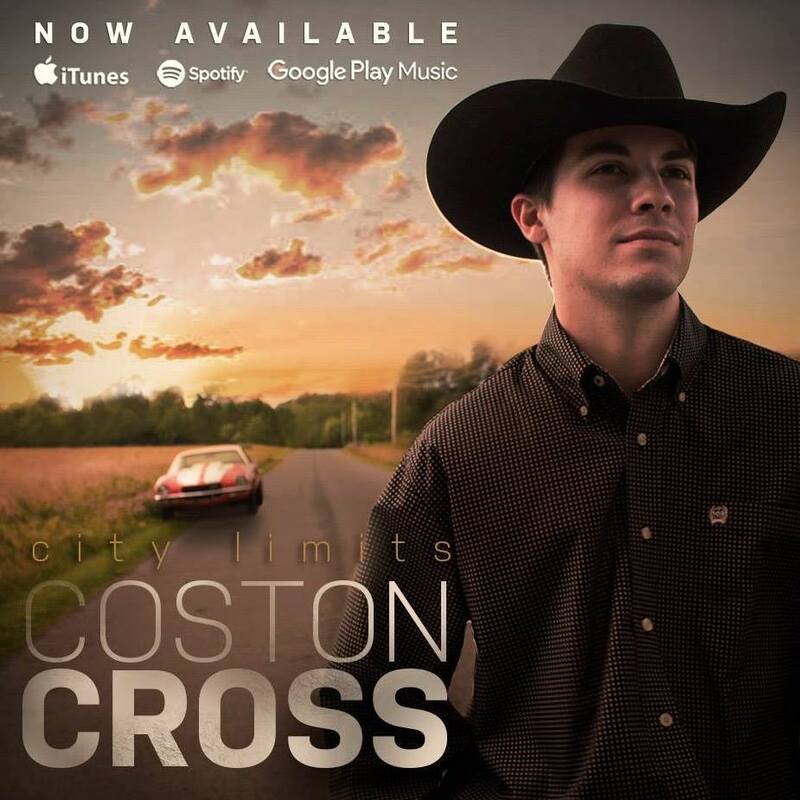 If you need to laugh, cry, or dance, I want to be able to deliver that connection to my fans.” Coston’s new album “City Limits” does just that! Paying homage to his time showing cattle, he wrote “Wild and Crazy Ride.” It is the up-beat romance of summer nights across the country on the album.